EVP was gaining popularity in Europe through the 60s and early 70s but was not very common in the states until the early 70s when George W Meek, Paul Jones and Hans Heckman opened a laboratory to study EVP and further research into a two-way spirit communication system. This organization came to be known as the Metascience Foundation. George spent much of the first portion of his research traveling to Europe and Germany learning about EVP and other communication methods. Meek was of the opinion that though the current research methods were sound in their theories, the technology was not conducive to direct two-way communication and often very difficult to understand. Meek believed that the spirit world is directly connected to ours through 5 layers with earth being the bottom most 6th layer. 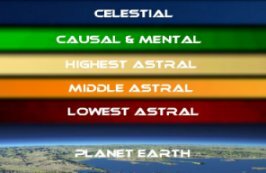 Each layer represents the next stage of existence starting with the point at which we leave our flesh and move onto the �Lowest Astral Level.� Then to the �Middle Astral Level�, �Highest Astral Level�, �Causal and Mental Level� and finally to the �Celestial Level.� Each layer has its own resonate frequency which he believed could be dialed in using radio frequencies. His work on a device called �Spiricom� was designed to bridge the gap between earth and the other layers which he was only partially successful until meeting psychic medium William O�Neil in 1973. O�Neil was successful in communicating with the spirit of Dr George J Mueller, a deceased American Physicists, who was instrumental in refining the operation of the Spiricom device. O�Neil logged more then 20 hours of successful two-way communication with Mueller. The communication device consisted of a tone generator which created 13 separate frequencies all with in the human male vocal range. These 13 tones were combined into a regular audio carrier which was broadcast a short distance via a 29mhz AM transmitter (29.575 mhz) to a 29mhz AM receiver which was fed into a speaker. All from within a faraday cage to shield from outside radio interference. I have encountered several sites which suggest that the transmitter was at 29 Mhz FM which is not the case according to the original manual, George used a modified HAM radio transmitting on the AM band. A cassette recorder was placed across the room from the receiver to record each session. The entire room was used as an echo chamber. The basic design of the device was to give the spirit a frequency upon which to inflect his or her voice through the airwaves much like the vocal cords do for the living. Dr Mueller�s voice was very robotic sounding and a constant buzzing sound could be heard under the voice. 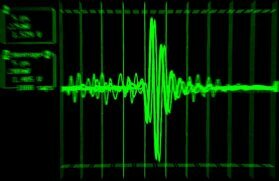 Unlike regular EVP, Mueller�s voice was heard in real time.Several spirits were able to come through at various times while the Spiricom was under the direction of William O�Neil but other users experienced only limited success which did not even come close to the communication O�Neil shared with Dr Mueller. Various designs were attempted within a 10 year span, but the designed worked on by O�Neil and Mueller dubbed the Mark IV was the most successful. In a skeptic�s eye, it would be easy to debunk this device as a glorified walkie talkie system using the amateur radio band as the medium for short range communication which would easily allow O�Neil to hoax George Meek into believing the device actually worked. This device could easily be the biggest breakthrough in proving life after death or one of the best EVP hoaxes to date. Unfortunately, the main players of this device have since passed on leaving only the Spiricom manual and various cassette tapes with audio bites from the machine in use. The Mark IV along with the other test models currently reside at the Metascience Foundation in a small town in Florida. Though research continues in George Meek�s absence, no one has been able to duplicate the efforts of William O�Neil and his two-way communication with Dr. Mueller though the plans for its construction are readily available on the Internet and in paper form for about 30 dollars. Twenty-five years of advancement in radio circuitry and technology have allowed the original bulky Spiricom device to be created in a miniature form. I have attempted to re-create George Meek�s original 29mhz device for use during paranormal investigations. 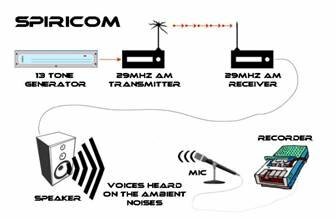 This device uses a standard a walkie talkie transmitter and receiver pair which have been re-tuned up to 29.575mhz from 27mhz. The transmitter portion consists of microprocessor creating the 13 original mixed tones. The units are placed about 10 feet apart. Unfortunately we have not received any communications via spirit or regular radio communication at this point, but will definitely keep trying.